John Ridout pays his bills! Theoretically anyway, it’s easy to trace a nineteenth century chap’s whereabouts… if certain records are available to you. Luckily for me, Bath is blessed with two great repositories, the Bath Central Library and the very excellent Bath Record Office; both are free to use and centrally located. In my x3 great grandparents’ day, those folk living above the poverty line had to pay money towards the care of those who lived below it (poor rate) and for the maintenance of roads, sewers, lighting and other general amenities of the area (city rate). These sums of money were collected quarterly in Bath and were based on the annual value of the property occupied by the payee. The payments were meticulously recorded in rate books, which can be very helpful in showing where the ratepayer lived at any given time and sometimes even when they moved into or out of an address. Another useful genealogical resource is the trade or postal directory. When these were first published in the mid-eighteenth century, only the more ‘respectable’ people in the community, such as the clergy, lawyers, doctors and landed gentry, were listed. As time went on more and more ‘ordinary’ folk were recorded too and so these books can reveal where our humbler ancestors lived or worked. In 1807, John RIDOUT was a newly married man and may have just finished serving a cabinet-maker’s apprenticeship. At the age of twenty-one he was probably too young to rent his own property or to run his own business and so he appeared in neither rate books nor trade directories. He could have remained ‘invisible’ for much longer had not he and his wife Sarah started a family. In 1809, the couple had their first daughter, Alice, baptised in the parish church of Walcot, followed in 1811 by son John. The family’s address wasn’t recorded in the register but at least John was once more in the records. By 1814, daughters Jane and Susan had been baptised in St Michael’s, a church at the top of Northgate Street. Susan’s baptism helpfully recorded her parent’s address as 24 Broad Street and so at last I could actually visualise my family living somewhere! I searched the rate books for St Michael’s parish and found that John’s tenancy of number 24 had actually started between Midsummer (21st June) and Michaelmas (29th September) 1812. Sadly, Jane and Susan died at Broad Street, both of them just five months old. 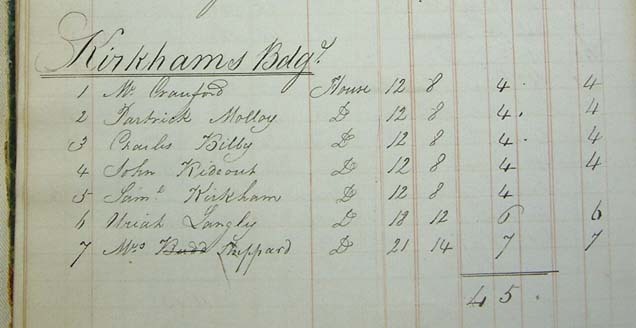 John and Sarah moved out of town, according to the rate books, ‘before Midsummer 1816’ and became the new tenants of 4 Kirkham’s Buildings in Bathwick, between Christmas Day 1815 and Lady Day (25th March) 1816. Sarah may have been pregnant when they moved since their son Henry was baptised at the old St Mary’s church in Bathwick during December 1816. I have hypothesised that John took his family out of the city centre because it was, by all standards, a bad place in which to bring up small children… they’d lost two, possibly three (I never ‘saw’ Alice again). Much as I have always loved Bath, I have to concede that in the early nineteenth century the city was probably a filthy, smelly, noisy and possibly even dangerous place to live. From their house in Broad Street, it was just a short hop to the slaughterhouse in Walcot Street and to the stinking, highly polluted River Avon beyond. Outside in the roadway, the noisy clattering of horses’ hooves and iron-rimmed coach wheels on the cobblestones must have been incessant as this narrow hill was on the main route to London. The move to the countryside, as Bathwick largely was then, may have saved the baby but did not spare the mother; Sarah was buried just five days after Henry’s baptism and had died perhaps as a consequence of his birth. She was thirty-two. John stayed in Kirkham’s Buildings for several more years and doubtless struggled at first, having at least the two little boys to look after. John’s only sister had died by 1807 and his two brothers were yet to wed so there may have been few women in John’s life that could have helped him out, but things would change for the better by 1818. This entry was posted in General, Individual and tagged Bath, Bath in Time, Family history, John RIDOUT, Rate books, Sarah HODGES. Bookmark the permalink.